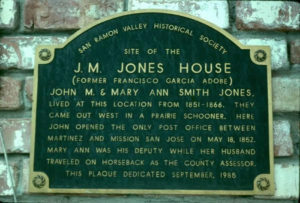 This San Ramon Valley Historical Society plaque is also State Historical Landmark Number 853. 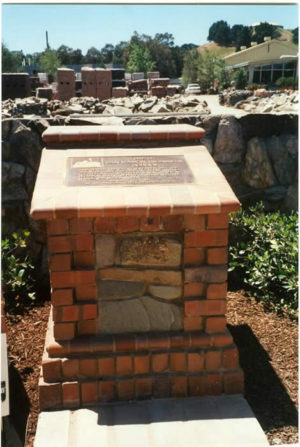 It commemorates the 200th anniversary of the first Spanish expedition through Contra Costa County. 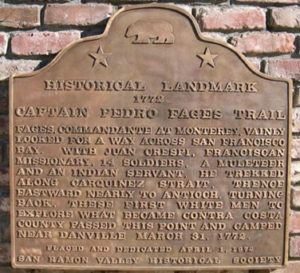 Led by Capitan Pedro Fages and Padre Juan Crespi, a small exploratory expedition camped near to the site of the plaque on April 1, 1772. Plaque location is on the corner of Danville Blvd. and El Portal on the Danville-Alamo boundary. The plaque dedication included an elaborate party and re-enactment on April 1, 1972, with Father Godfrey McSweeney from San Damiano Franciscan Retreat as Crespi and historian Dr. Wilson Close as Fages. For a longer article about the Fages-Crespi expedition, click here. 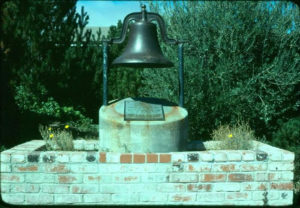 This bell once hung at an early Alamo School, from the 1880s to 1940. It is now located on a pedestal at the Alamo Elementary School site at 100 Wilson Road in Alamo. It was dedicated on March 22, 1974. For a longer article on the Alamo School Bell, click here. A grove of redwood trees, planted by Charles Goold and his wife, Allie Johnson Goold, in 1913, and a bronze plaque commemorate the pioneer home site of the Goolds. The site was acquired by the family in 1900 and is located in the Sycamore Shopping Center parking lot in front of the Longs Drug Store in Danville. The plaque was dedicated March 22, 1975. For a longer article on the The Goold Family, click here. Pioneer brothers Nathaniel and Charles Howard built this large home and lived in it with their families beginning in the mid-1850s. School classes were taught there until the Howards built the first Green Valley Grammar School in 1865. 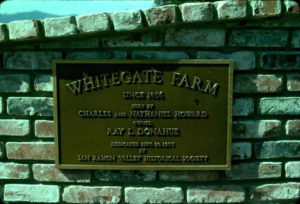 Later called “White Gate” by its owner Raymond Donahue, the building was much changed and later demolished. The plaque is now mounted on a brick pedestal on Shandelin Court near Stone Valley Road in Alamo. It was dedicated on September 20, 1975. For additional information on White Gate Farm, click here. The original Danville Hotel was located on Front Street from 1858 to 1873, when it burned down. Today’s Danville Hotel was built in 1892 just after the railroad came to the valley and located on Railroad Avenue. It was two-stories with 10 rooms and was run by the McCauley family. In 1927, as Hartz Avenue became the main downtown street, the hotel was moved to Hartz where it stands today. Painted red and white, in 2012 the Sideboard Coffee House is in the building. The plaque was dedicated in Nov. 19, 1977. For additional information about the Danville Hotel, click here. At 3,849 feet tall, Mount Diablo looms over the entire East Bay. In 1851 it became the initial point for meridian and base lines which initiated American legal surveys for most of Northern California and all of Nevada. California has two other initial points. This plaque was dedicated as State Historical Landmark Number 905 and is located at the base of the Summit Museum building. State Senator John A. Nejedly helped dedicate the plaque and, as shown in the picture, plaque organizer Egon Peterson served as master of ceremonies. Dedicated on April 23, 1978. 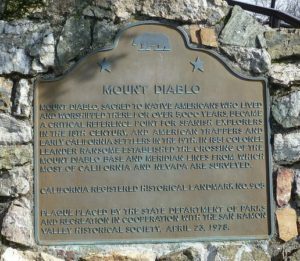 For more information on Mount Diablo, click here. This historic non-sectarian pioneer cemetery received its first recorded burial in 1856. Many of Alamo and Danville’s first residents are buried in this well tended cemetery. It is located east of Danville Blvd. on El Portal in Danville. The Museum of the San Ramon Valley provides spring and fall public tours and group guided tours by reservation; call 837-3750. For information on burials, contact the Alamo-Lafayette Cemetery District at 284-1353.. Dedicated on May 31, 1980. For more information on the Alamo Cemetery, click here. The Albert J. and Mary Shuey Young home, located at 911 San Ramon Valley Blvd., is currently part of a medical complex. The Victorian home was built by the Youngs in 1870. Mr. Young was a teacher in several valley grammar schools and served as a member of the county board of education, as well as the Superintendent of the Presbyterian Sunday School. 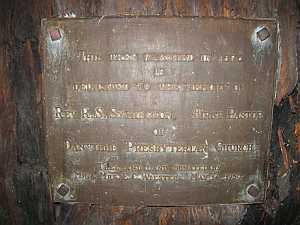 A plaque commemorating their home of 63 years was dedicated in August, 1984. To read more about the Albert and Mary Young House, click here. The Jones family arrived in 1851 and were the founders of Alamo. Beginning in 1852, he was the first postmaster and she assisted him, since the post office was in their house. They helped start the first grammar school, the Union Academy (high school), and Cumberland Presbyterian Church. The plaque is on the side of a commercial building northeast of Stone Valley Road and Danville Blvd. Dedicated on Sept. 15, 1985. To read more about the Jones House, click here. 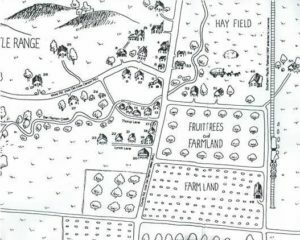 This an etched drawing of early San Ramon which depicts homes, businesses and ranchlands of the area from 1850 to 1915. It is located in the San Ramon City Hall. Dedicated on May 11, 1989. For more information about the San Ramon's Hey Days, click here. The Sycamore School opened in 1866 with teacher Miss Mary Hall presiding. 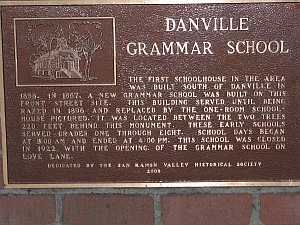 It provided grammar schooling for Sycamore Valley students until 1927 when students transferred to the new Danville Elementary School on Front Street. Used as a residence for years,the buildingburned down in 1945. The attendance area extended to the Danville School District on the west and the Tassajara District on the east. The border between Sycamore and Tassajara Schools was Hansen Lane, just east of today’s Oak Gate Dr. off Camino Tassajara. The plaque was dedicated on July 28, 1990. To read more about Sycamore Grammar School, click here. James Close Property can be found on the south side of Diablo Road between Hartz and Front Streets in Danville. The property site was originally owned by pioneer Daniel Inman, for whom Danville was named. James Close was a naturalized citizen emigrating from Canada. Close purchased the property including a blacksmith shop in 1875, where he practiced his trade and lived with his family. 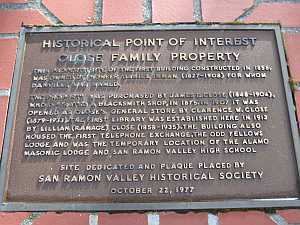 The San Ramon Valley Historical Society dedicated a monument in memory of the Close family, September 22, 1996. The San Ramon Grammar School served the community from 1867 to 1950, an impressive 83 years. An all-wood structure, it had two large rooms with 13-foot ceilings and a bell tower. The school was an important landmark and, until the San Ramon Hall was built in 1911, was also used for meetings and dances. A partition in the middle would be removed to enlarge the space. Students moved to a modern building near today’s Crow Canyon Road in 1950. The original school was razed in 1960. Dedicated May 17, 1997 at 2233 San Ramon Valley Blvd. in San Ramon. 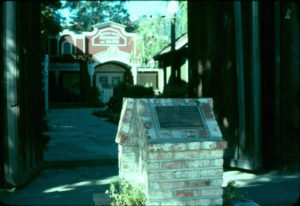 The Tassajara Grammar School now dedicated with a plaque was the second Tassajara school. It was built in 1889 and closed in 1946. A classic one-room school with a bell tower and flag in front, over the years it has served as a location for meetings, a polling place and a site for picnics. The building was saved and restored by members of the Tassajara community, led by the all-volunteer Tassajara Fire Protection District. In 2012 it was deeded to the Museum of the San Ramon Valley. After much effort by museum volunteers, the school house was placed on the National Historic Register in 2014. Each spring, a one room school program for third graders is provided by the Museum of the San Ramon Valley. Dedicated August 14, 1999 at its location on 1650 Finley Road. SRV Historical Society members are shown admiring the new plaque. Former student and rancher Gordon Rasmussen is the person in the cowboy hat. 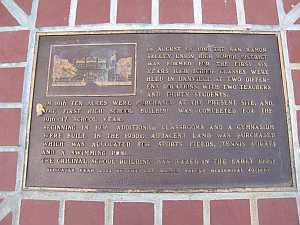 Several Alamo Grammar Schools were recognized by the dedication of this plaque. While school classes were held earlier, the first known school was constructed on the northwest corner of Stone Valley Road and Danville Blvd. in 1871. Artist LuAnn Styles created the line drawing of the second school (1880s to 1940) which had a bell tower and was extensively remodeled several times. Dedicated October 14, 2000. 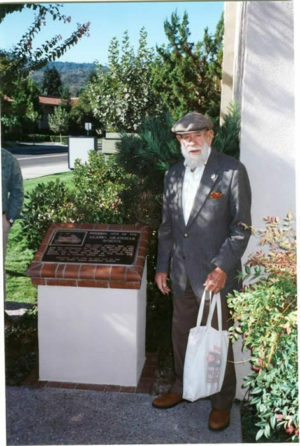 Elwin "Rocky" Stone, a former student who helped dedicate the plaque, is shown in the photograph. For more information about the Alamo School, click here. 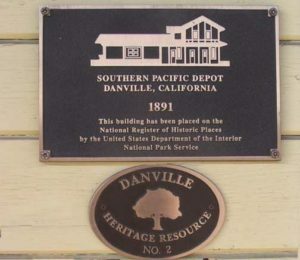 The depot located at the intersection of Prospect and Railroad Ave., Danville, was used by the railroad company from 1891 until the 1950s. It originally was located some 250 yards to the south where the Lunardi’s market currently stands. 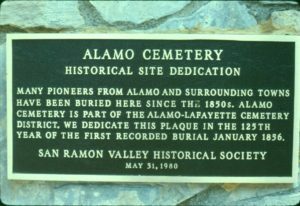 The depot is the home of the Museum of the San Ramon Valley which provides historical exhibits, tours of Danville and the Alamo Cemetery and a research library. The plaque commemorating the depot was dedicated December 9, 2001. The San Ramon Valley Union High School District was formed in August of 1910. The initial classes were held in Danville at two different locations. In 1916 ten acres were purchased at the present site and the school was built and ready for the 1916-17 school year. Additions of classrooms and a gym were built in 1936. In the 1950’s additional, adjacent land was acquired and allocated for a sports field, tennis courts, and a swimming pool. The original building was taken down in 1950. The school located at 140 Love Lane had a commemorative plaque dedicated August 23, 2003 near the school’s electronic sign. For more information on San Ramon Valley High School, click here. 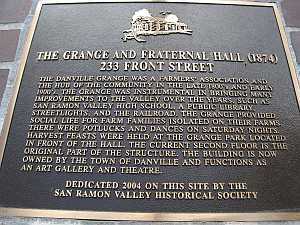 The original Danville Grange No. 85 was founded in 1873. The Grange was an important organization in the Valley for and served as a community organization whereby families could meet, socialize and deal with the agrarian issues of the day. The original building was became the second story of a new Social and Fraternal Hall which was completed in 1913. Today the Hall is the Village Theatre at 233 Front St. in Danville. A plaque to commemorate the Social and Fraternal Hall was dedicated January 22, 2005. The town’s first grammar school was built south of Danville in 1858. Later schools were located on Front Street and included a classic school house, which opened in 1896 and served students until 1922. Teacher A. J. Young taught in both the old and new school houses from 1883 until 1900. The plaque dedication commemorating the grammar school was held on October 18, 2006. 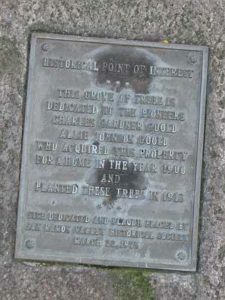 The plaque is located on a redwood tree (planted in 1876) just north of the Danville Town Meeting Hall on Front Street. It was placed on the tree in 1956 by Ed and Hazel Wiester to commemorate Rev. Symington, the first pastor of the Danville Presbyterian Church and marks the movement of the church from this location to its new site on El Pintado Road.